The drape and generous cut make this piece work-appropriate, while the just-sultry-enough lace detail and back cutout keep things interesting for after-hours. Bonus? Since it rings up at less than $40, you—and your wallet—can be proud of this multi-tasking top. 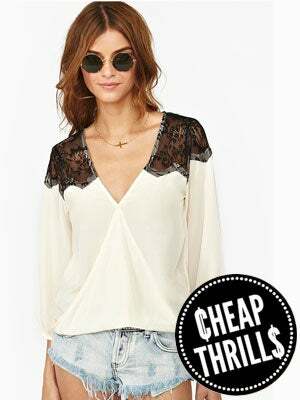 Nasty Gal Twisted Lace Blouse, $38, available at Nasty Gal.